Mountainous terrain confronted the Division in practically every phase of the Italian campaign. With it came the enormous task of getting supplies to the frontline forces and evacuating casualties. In the Mount Maggiore and Mount Sammucro sectors, pack animals carried the food, water and ammunition as far up the steep muddy trails as possible, round trips requiring eight to ten hours. Hand-carry was common and laborious. In addition supply routes were frequently under enemy fire and observation. 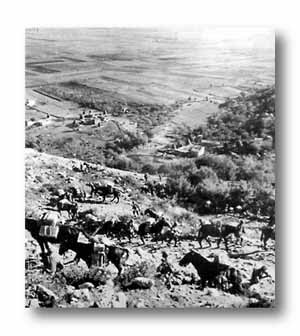 STEADY PACK HORSES AND MULES HAD TO BE USED WHEN JAGGED PEAKS MADE MECHANIZED TRAVEL IMPOSSIBLE. START OF ANOTHER four-hour, five mile pack-train ordeal up the mountainside with supplies for men on top. PACK ANIMALS could go only so far; strong-packed infantrymen bore the burden to foremost positions. LEFT, PACK TRAIN WINDING ITS WAY UP THE STEEP SLOPES NEAR VENAFRO. SOMETIMES ITALIAN MULE SKINNERS WERE USED. 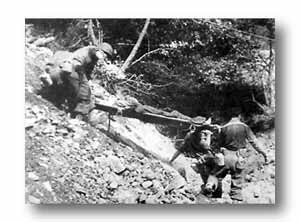 DOUGHBOYS HELP AID MEN CARRY A WOUNDED COMRADE DOWN THE TREACHEROUS TRAIL ON MOUNT MAGGIORE.